This plant-based "smoothie bowl" is a perfectly-portioned breakfast or cool afternoon treat! Place the banana, blueberries, ⅓ cup milk beverage, strawberries, raspberries, and chia seeds in your blender and puree until smooth. Blend in more milk beverage if needed. It should be very thick. Blend in sweetener, to taste, if desired. 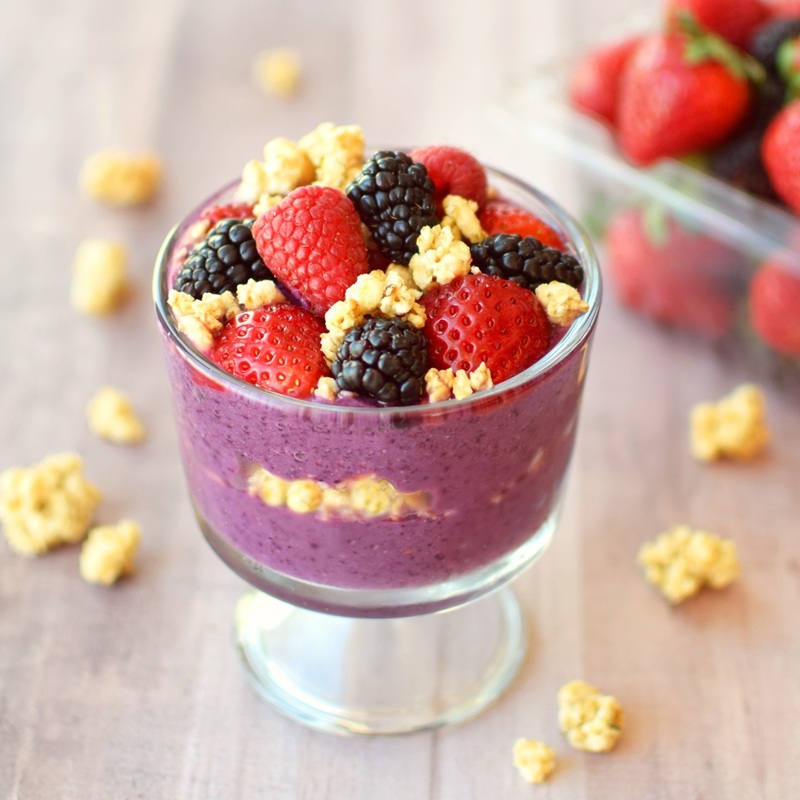 Scrape half of the smoothie into a wide-mouth or parfait glass. Top with three-fourths of the granola. Scrape on the other half of the smoothie. Top with more fresh berries and the remaining granola. Granola or Crisp Options - The archer farms granola I used was light and crisp. I recommend this type rather than a dense, chewy or overly crunchy one. For more of a dessert, make no bake crisp topping. Stir together ½ cup quick oats, ¼ cup oat flour, ¼ cup brown sugar or coconut sugar, and ⅛ teaspoon salt. Whisk in 3 to 4 tablespoons melted coconut oil (as needed) and 1 tablespoon maple syrup until it forms relatively even clumps. Chill it in the refrigerator or freezer for 20 minutes. Use as crumbles on your smoothie parfait!